The new protected intersection in Davis, the first in the United States to open, has been in the news recently (#Damien Talks Episode 13 – The Davis Planning Department on the Bike Protected Intersection (Streetsblog), This California city just built the country’s first protected intersection for bikes (Vox), It Just Works: Davis Quietly Debuts America’s First Protected Intersection (Streetsblog), Davis Dutch intersection, first ever in U.S., unveiled with no drama (Davis Enterprise), and others). Though it did not initiate the movement towards protected intersections, which have long existed in some form in Europe, Nick Falbo’s Protected Intersection video has popularized the idea in the United States. Yesterday I spent about an hour looking at the intersection. It was mid-day, so lightly used by bicyclists, pedestrians and motor vehicles. I might have a different impression at a different time of day. I was on my knee scooter, my current method of getting around, so acting as a pedestrian and not a bicyclist. The design is at the intersection of Covell Blvd and J Street/Cannery Row, on the north side of Davis. The intersection was revised because of the major new development north of Covell, The Cannery, which has recently opened but is still being developed. Some photos are on Flickr. With one exception (below), the intersection worked just fine for all modes. Most bicyclists were on Covell headed east or west, and they used the on-street bike lanes. I saw one person use the ramp up to sidewalk and back down, and one bicyclist use the design to turn left from Covell westbound to J southbound. No issues. I also saw a number of pedestrians crossing in various directions. No issues. The signal cycle is slower than it probably needs to be, but, again, that might be different during commute times. The one part of the design that doesn’t work is the part that is a concession to the old way of designing roads. There is a dedicated right turn lane from Covell eastbound to J southbound. The photo at right shows the setting. Almost every motor vehicle driver turning right used both the bicycle lane and the right turn lane, not moving into the right turn lane though the pavement marking clearly indicates this is the right thing to do (pavement markings, in this case and most cases, are not legal requirements, but guidance). In the entire time watching, I did not see one single right-turning motor vehicle driver stop for the red light. Not one. All of them were taking advantage of the wide turning area to make a higher speed right turn than they could have otherwise. The law clearly requires a stop before turn on red, so every one of these drivers was violating the law. Every one. I think the right hand turn lane must be removed. It apparently was justified by the heavy volume of motor vehicles turning from Covell to J, but in my time in Davis using Covell, I haven’t ever seen this. J Street is simply not a heavily used street. The whole point of a protected intersection is to protect all users, and if this motorist behavior continues, there will be crashes with bicyclists and pedestrians. Bicyclists using the bike lane are at risk, and both bicyclists and pedestrians crossing Covell are at risk because a driver who does not stop is unlikely to see people in the bike lane/crosswalk to their left. 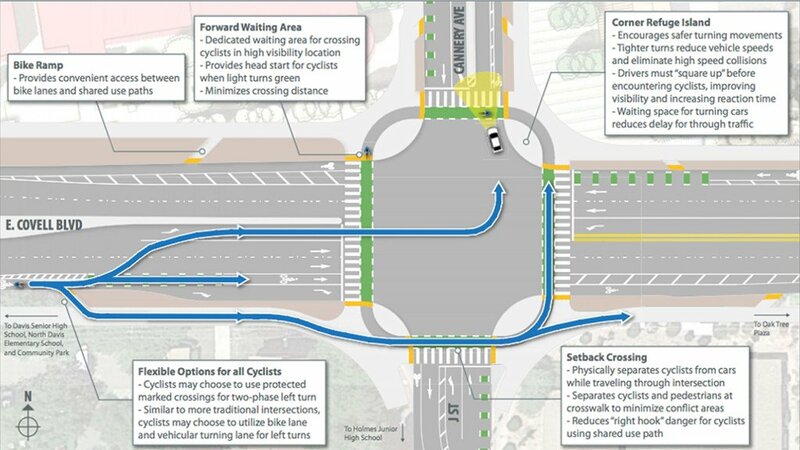 This concession to old-style design does not work and should not be part of this protected intersection. Even if traffic counts justify it, which I doubt, safety considerations prohibit it. Some people have asked about the exit and entry ramps for bicyclists who want to leave the street and use the protected facilities. The ramps are a bit abrupt. The gradual ramp up and ramp down which was, I think, invented in Bend, Oregon and is now a feature of modern roundabout design, is more familiar and comfortable to me. But I think that the ramps work. Other people have asked about separation between bicyclists and pedestrians. Crossing the streets, there is a clear demarcation, so no problem there. It is not as clear on the shared sidewalks. There is a subtle color differentiation, with pedestrians having plain sidewalk and bicyclists having tan concrete. Where the exit and entry ramps have bicyclists moving on and off the shared sidewalk, there is no differentiation. Whether this will be a problem at busier times of day, and when the new development greatly increases bicyclist and pedestrian use, I can’t say. 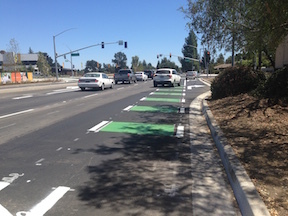 Many bicyclists in Davis are comfortable riding in traffic, making normal left turns, so these ramps may not ever get high use. The footprint of the intersection is large, made larger by the setback of the bike lanes and crosswalks. It feels wide-open. But I did not see any poor behavior by bicyclists or motor vehicle drivers engendered by the large space. When this type of intersection is retrofitted into an already developed area, there will be restrictions that will necessitate a tighter design. Modern roundabouts, which are much safer for pedestrians and drivers, and a bit safer for bicyclists, also take a lot of space. Overall, I’d like to recognize Davis for taking the initiative to put this protected intersection in. It may not turn out to be the ideal design, but a lot will be learned from it, and that is how all cities should be proceeding – to experiment and learn. Those who object to this innovation because we aren’t sure exactly how it will work and what challenges it will surface, probably won’t be reading this post because they are still reluctant to try that new-fangled thing, the Internet.